We are very impressed with the recently decorated model home in CarrHomes’ new Saratoga Towns community in Springfield, VA. There are going to be a total of 10 2-car garage townhomes. We first learned about this community last year, and as of now, 4 have been sold, 2 are standing and ready-to-go, and 4 are to be built. The last 4 will back up to a pretty tree line. The model is very open and contemporary; it features a 9’ long center island in the chef’s kitchen, along with granite counters and stainless steel appliances. The main level includes lovely hardwood floors, elegant crown molding and a floor-to-ceiling stone fireplace. Below, you’ll see the bedroom of the super glamorous full-floor owner’s suite. This is really a cool feature with its generous 11’11 x 9’8 den and the owner’s spa bath with optional “walk-in dream shower”. This home is 4 levels and the 4th level features 2 bedrooms sharing a Jack & Jill bath. The 3-level units are in the upper $500,000s and the 4-level ones are in the low to upper $600,000s. 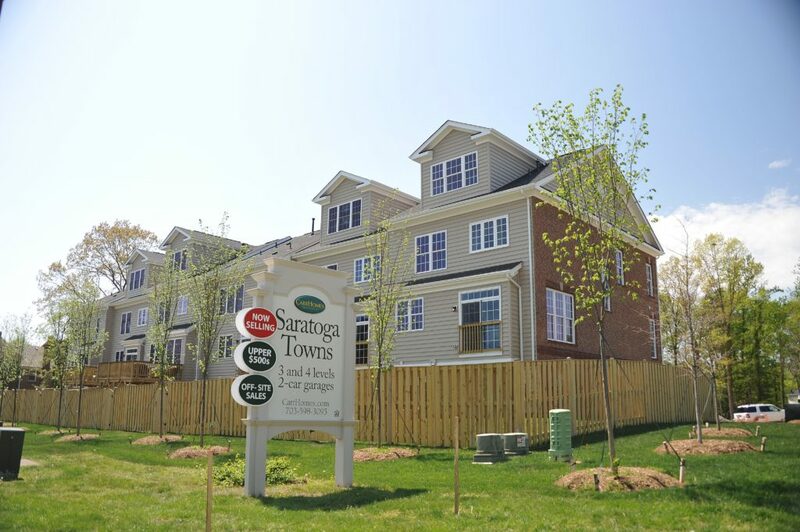 Saratoga Towns is well-located near all major transportation routes, the Saratoga Park and Ride, Fort Belvoir, the Springfield Town Center and more! Are you thinking about purchasing a new construction home? Give us a call at 703-822-0207 or shoot us an e-mail (tomandcindy@hellovirignia.com) anytime–we would be more than happy to assist you!